The weather as of early November is finally where it should be for this time of year (chilly). However it's been a BEAUTIFUL autumn and thank goodness for no snow yet. Sports will slow down briefly with high school football almost over (there's still a few teams in our area remaining in the playoffs) but will pick back up again with basketball coming by the middle of the month. Still have been part of some cool things recently as far as the news stuff goes. By the way you can now click on the photos and view them full screen with caption (or lightbox as the cool kids call it). You can also hover over the picture for caption info now instead of just seeing it right below the image. Doug Alderman, far left, owner of Railway Public Studios, films cast members acting out a scene Oct. 26 as part of a promotional video outside of the Orpheum Theatre in Galesburg, Ill. The promotional video features antique cars, people dressed in old-style clothing and dancing girls, with a scheduled release online in November. 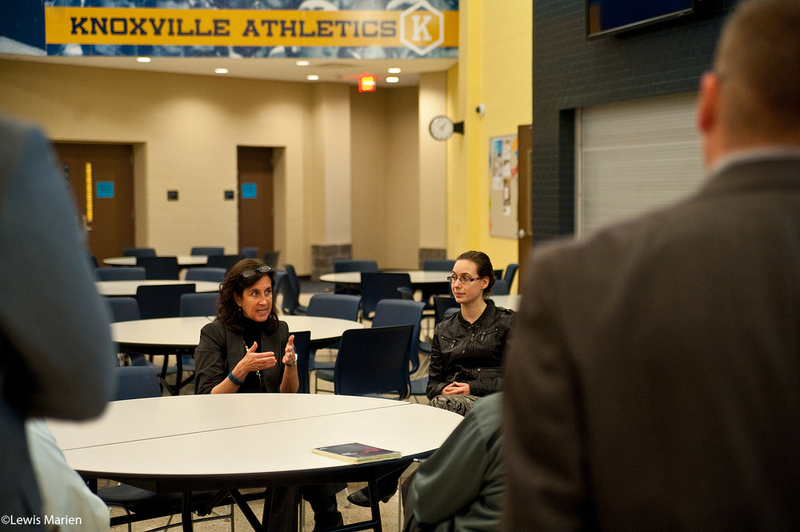 Illinois Secretary of Education Beth Purvis talks with local school administrators Oct. 27 following her tour of Knoxville High School in Knoxville, Ill. Purvis toured several school districts throughout the day. Rockridge's Drake Schroeder (86) has a little fun during his team's huddle after they beat Rushville-Industry 42-21 in the first round of the IHSA Class 2A playoffs Oct. 30 at Bob Wixom Field in Rushville, Ill.
Spring Valley Hall's Drew Pullam (4) hikes the ball during the Red Devils' IHSA Class 2A first round playoff game with the United Red Storm on Oct. 31 at Richard Nesti Stadium in Spring Valley, Ill. The Red Devils beat the Red Storm 34-0. Spring Valley Hall's Jake Merkel (23) stiffarms United's Nick Penn (21) during the Red Devils' 34-0 win against the Red Storm Oct. 31 in the first round of the IHSA Class 2A playoffs. Rep. Norine Hammond, R-Macomb, announces her re-election campaign to local media and supporters Nov. 4 at the Knox County Courthouse in Galesburg, Ill.
Mike DeSutter, left, of Woodhull, Ill., announces that he will seek the Republican nomination for state representative of the 74th District on Nov. 5 outside the Knox County Courthouse in Galesburg, Ill.
ROWVA High School sophomore Charlie Gibbons, right, leads a group of students in the chant "2n2 is what we do" during a pep rally Nov. 6 in the school's gymnasium. The school located in Oneida, Ill., has been named a finalist out of 50 schools nationwide for the "Celebrate My Drive" competition sponsored by State Farm, with one school receiving an Echosmith concert and 10 other schools each receiving $100,000 grants. Knox College senior Sophia Spooner, center right, explains different types of microgreens Nov. 7 during a workshop at the 2015 Prairie Fire Bioneers Conference inside the Ford Center for the Fine Arts on the Knox College campus. A participant gets a hands-on experience with grown microgreens Nov. 7 during a workshop at the 2015 Prairie Fire Bioneers Conference inside the Ford Center for the Fine Arts on the Knox College campus. K.C. Hill, of Galesburg, Ill., looks through a copy of "Outside the Rails: A Rail Route Guide from Chicago to La Plata, Mo.," Nov. 7 at the Galesburg Public Library. The book, by authors Robert and Kandace Tabern of Wadsworth, Ill., explores in great detail the sights that passengers see out their train windows when passing through Illinois, Iowa, and Missouri aboard Amtrak's Southwest Chief train out of Chicago. Stark County's Zade Musselman (63) is fired up following his team's IHSA Class 1A second round playoff game against Forreston Nov. 7 in Forreston, Ill. The Rebels beat the Cardinals 42-16 to advance to the quarterfinal. Stark County's Keith Ehnle (65) and Caleb Davis (62) celebrate the Rebels' 42-16 win against Forreston following the IHSA Class 1A second round game Nov. 7 in Forreston, Ill.
A member of the Monmouth College Pipe Band warms up prior to the start of the 15th annual Veterans Parade Nov. 8 in downtown Galesburg, Ill.
Members of the Illinois Patriot Guard ride down East Main Street in motorcycles during the 15th annual Veterans Parade Nov. 8 in downtown Galesburg, Ill.